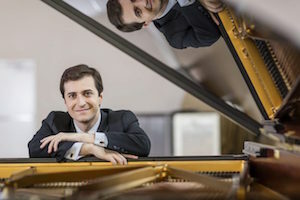 Pianist Kenny Broberg will come to Pepperdine University's Raitt Recital Hall as part of the Recital Series performances of the 2018–2019 season on Sunday, February 10, at 2 PM. A native of Minneapolis, Broberg won the silver medal at the 2017 Van Cliburn International Piano Competition with performances marked by “an imaginative shaping of themes, revelation of inner voices, and an unfailing sense of momentum” (Texas Classical Review). He continues to build a reputation for fresh interpretations, distinguished by a “bright, pearly tone quality” and “a clean, pellucid beauty” in his sound (Star Tribune). As a prizewinner of the Hastings, Sydney, Seattle, and New Orleans International Piano Competitions, Broberg has previously performed as soloist with the Royal Philharmonic, Minnesota, Sydney Symphony, Seattle Symphony, Dallas Chamber, Fort Worth Symphony, and the Louisiana Philharmonic Orchestras, among others, working with conductors Ludovic Morlot, Leonard Slatkin, Nicholas Milton, Nicholas McGegan, Carlos Miguel Prieto, and Stilian Kirov. During the 2017–2018 season, he made his subscription concert debut with the Minnesota Orchestra—stepping in for André Watts days before the performance—which was declared “a highly auspicious debut, marked by poise [and] technical brilliance” (Star Tribune). Other recent highlights include residencies at the Methow Chamber, Strings, and Sunriver Music Festivals, and recitals in Houston, Denver, and Minneapolis, and in Italy and the United Kingdom. Throughout the 2018–2019 season, Broberg will perform at the Orchestre symphonique de Montréal’s Festival Virée Classique and make his return to London with the Royal Philharmonic Orchestra. Recital and orchestra engagements will take him to Minneapolis, Kansas City, Madison, Montreal, Pittsburgh, Los Angeles, and other cities across North America, and he makes his debut performances in Asia, with appearances in Shanghai and across Japan. The first musician in his family, Broberg started piano lessons at age six, when he was first fascinated by his mother’s upright—a wedding gift from her parents. He studied for nine years with Dr. Joseph Zins before entering the University of Houston’s Moores School of Music, where he earned a Bachelor of Music degree with Nancy Weems in 2016. He currently resides in Parkville, Missouri, under the guidance of 2001 Cliburn Gold Medalist Stanislav Ioudenitch at Park University. Alongside his teachers, he is influenced by the recordings of Alfred Cortot, William Kapell, and Claudio Arrau. Ticket prices range between $10 and $28. For additional information about this event, and to purchase tickets, visit the Center for the Arts website.